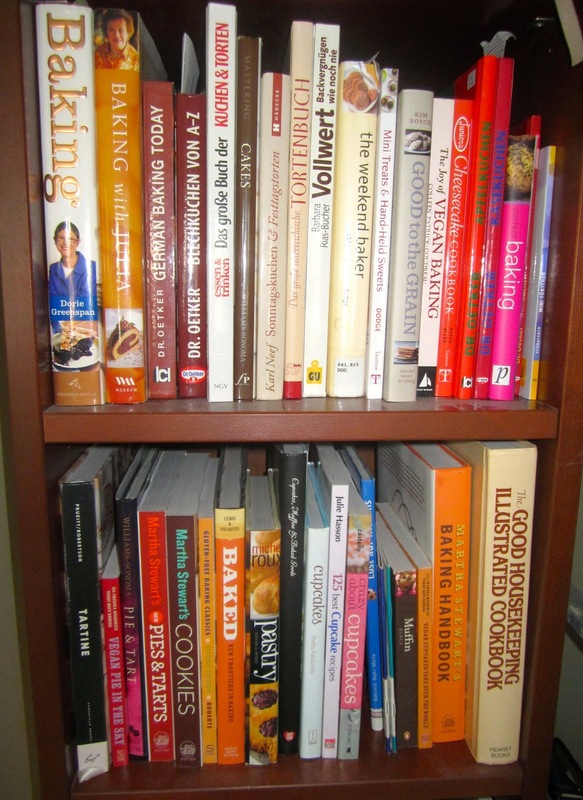 In a recent blog event, Steph from Kleiner Kuriositätenladen asked what our kitchen looks like behind the scenes, which cook books we use, and where we do our blogging. Since 5 years I am licensed to sell breads (and cupcakes) from my home. My kitchen was officially inspected, and I’m paying every year 20 bucks for the renewal of my Home Processor’s License. 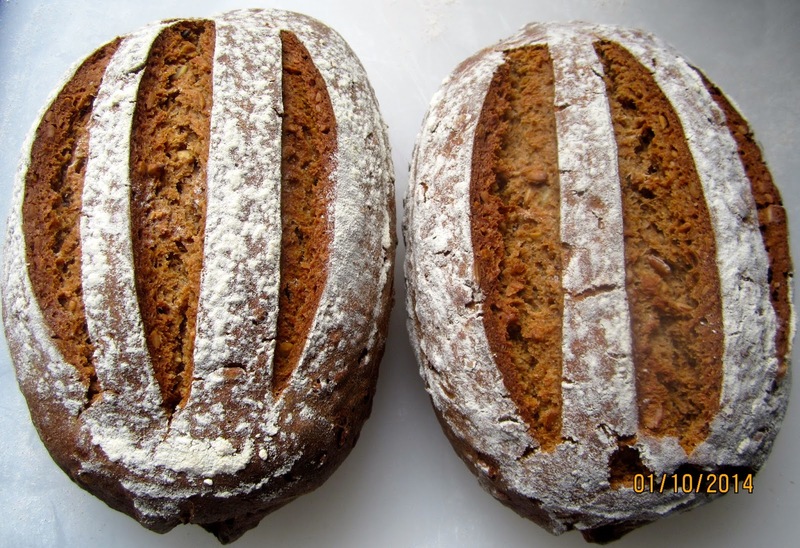 I bake European breads for A&B Naturals, our our local natural food store – in summer twice, in winter once a week. Since my breads are quite popular (modest blush! 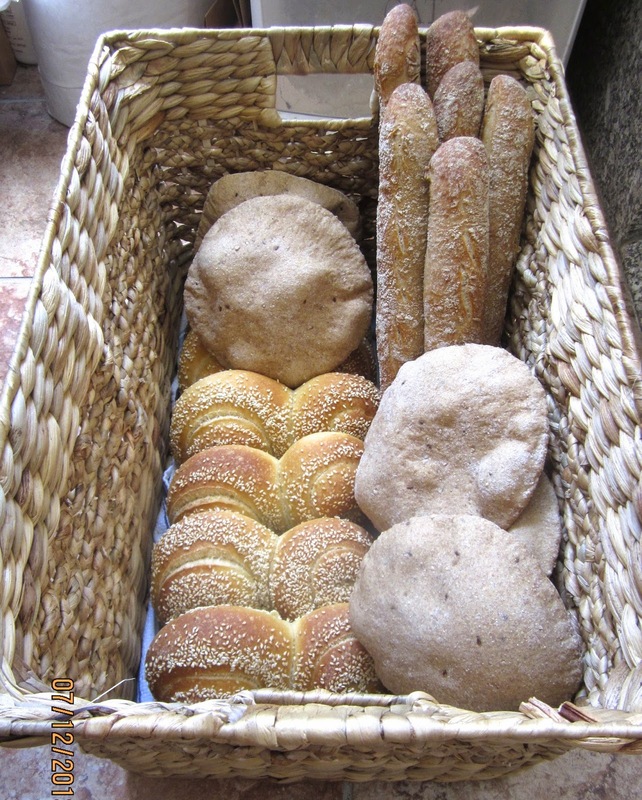 ), it’s more our less “baker’s choice” what I want to make for them – as long as my rustic baguettes and Multigrain Pitas are also in the basket! 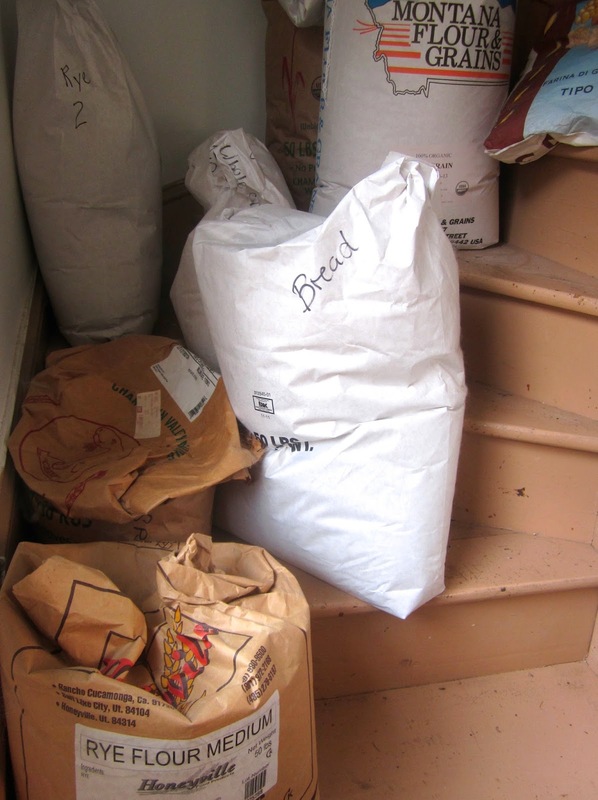 Backstair storage for rye, wheat, spelt & Co.
Our basement is too damp, therefore our kitchen backstairs was re-purposed for flour storage. 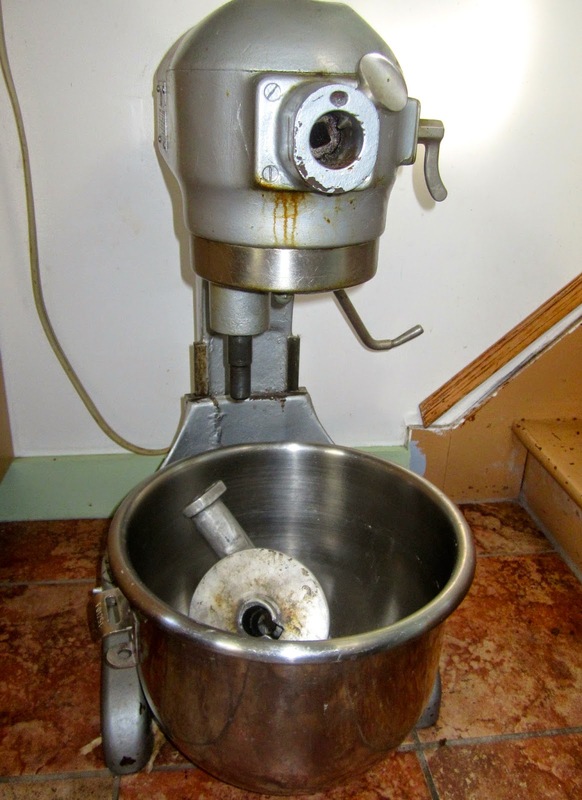 For larger amounts of dough I need a reliable work horse. Mine is a 20-qt Hobart, purchased from a store for used restaurant appliances. Though moaning and groaning loudly when it kneads, it handles even the stiffest multigrain doughs. 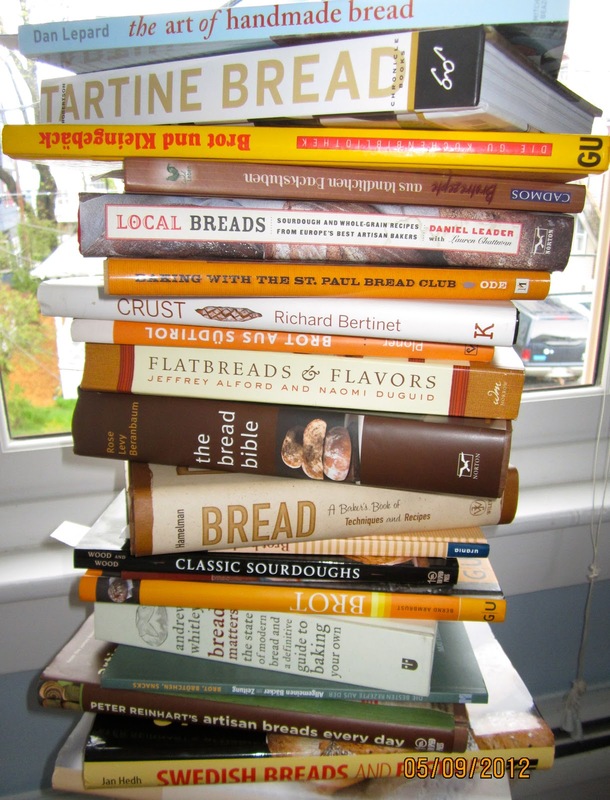 The inspiration for my breads I get from an ever-growing book collection, baking facebook friends, Fresh Loaf bakers, and other bloggers. No wonder that I have to fast now and then…. My mobile workplace is my Mac, I carry him up and down in the house. 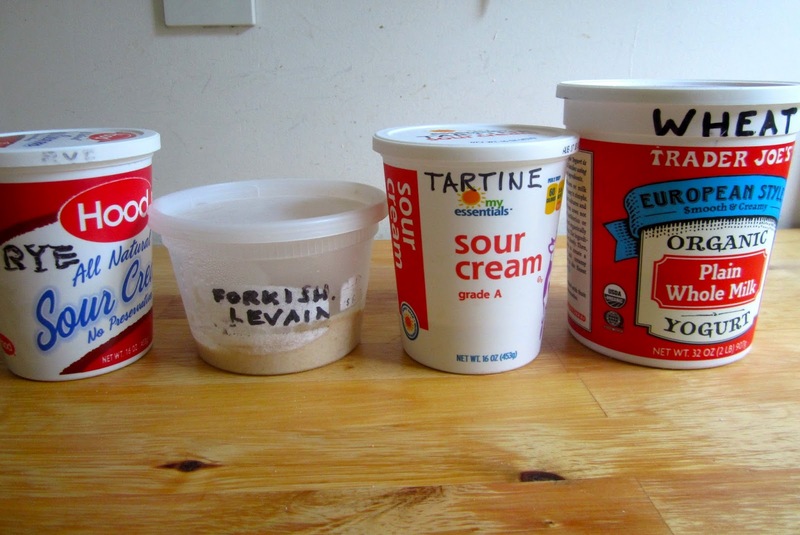 My recipe management programs are Paprika, and BreadStorm (especially for breads). And sometimes a Queen (of the Night) keeps me company! 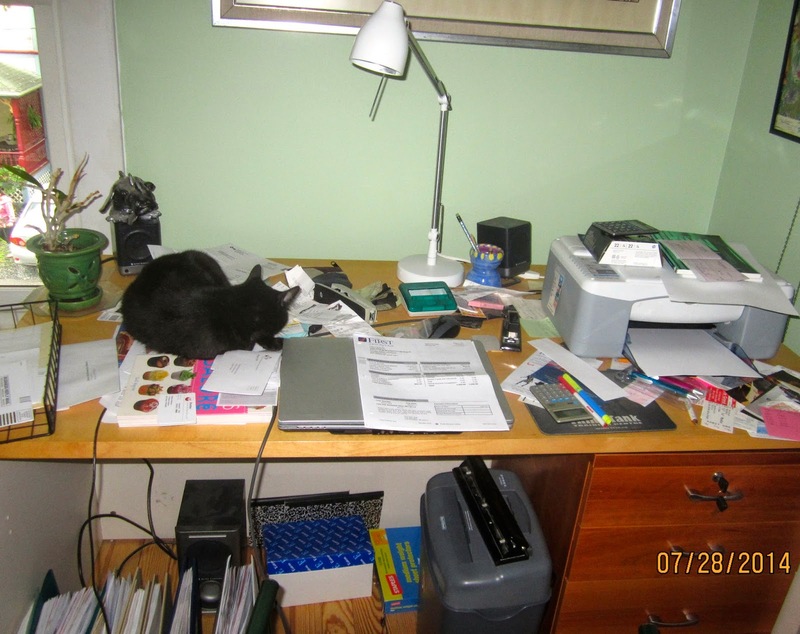 Of course I also have a desk – but there I’m not that often – it’s occupied by somebody else – Toby! 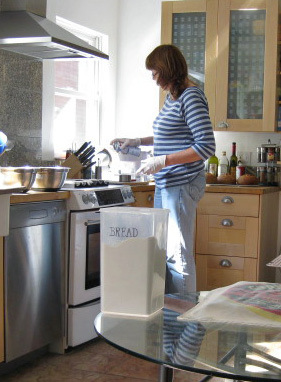 Flour on the table, pitas on the rise, freshly baked breads in the background, mixing bowls on the dishwasher, and I’m spraying baguette pans with oil – a typical baking day. 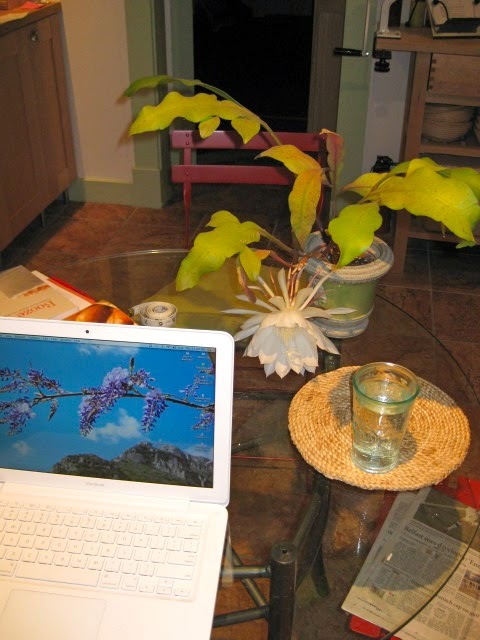 My kitchen is my working and living room! Ooh, now that you've shared all your trade secrets, the local groceries are going to be flooded with Karin's Bäckerei wannabees, you may have to step up your game. Thanks for the inside tour, Karin, it's fascinating to see how you run a bakery from a household. Thank you, that was fun. I see we have the same 'taste' in cookbooks 🙂 May I recommend La Tartine Gourmande and Small Plates & Sweet Treats? Great books. I tried to register for the Fresh Loaf Baker's blog and could NOT 😦 Your breads look great. I too bake a lot of bread and it is my favourite thing to do…nice you can bake whatever suits your fancy! Mostly impressing- the Queen of the Night; mine never flowered…..
No fear of that, Don, we have two local bakeries that sell mainly packaged soft sandwich breads (but have nice cookies and scones). In Germany with all the regulations I wouldn't have been able to make a tiny business out of my hobby, but in Maine (after proper inspection) people can sell stuff from their homes. Thanks, Susan, I will check on those books – as everybody knows, one can never have enough cookbooks! Please, do try again to register at The Fresh Loaf, sometimes they have issues with their website, but it is a nice community where I have learned a lot over the years, and a great resource. Thanks, Ninive, most of the time this Royal is an ugly, straggly plant. We “inherited” one when our daughter left for college. I tried to encourage more compact growth by cutting some branches off (without any success! ), and one branch took roots. One year we had a lot of flowers, but this year only one, blooming on a night we were not at home. They are definitely iffy! I assume we are sending a picture of our loaf 🙂 My favourite loaf (4 lb) is not an original but would feed the Knight et al before going out to do battle! I was several times tempted to throw it away – and the cats now and then pawing at the branches doesn't do anything to enhance its beauty. 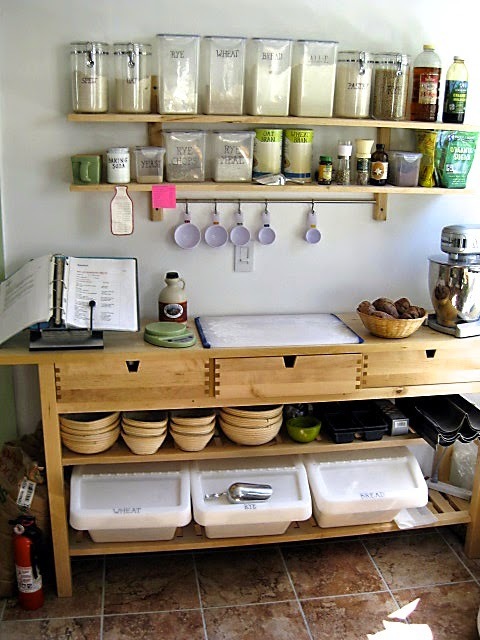 Thanks for giving us a peek into your kitchen! 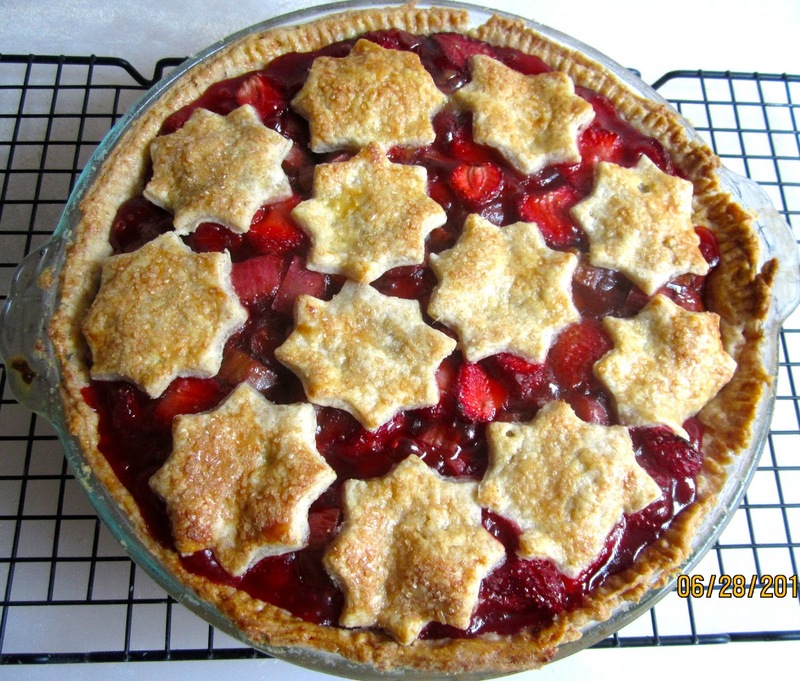 How nice to have the freedom to bake whatever you want. You're lucky to live in Maine. Here they don't allow home based food businesses. I'm sure he would like the idea of a really big loaf to share with his buddies. If you send me photos (loaf and crumb shot,) and the recipe to my email address (see the challenge post), I'll be happy to include it in my round-up. In Germany they wouldn't allow that, either. 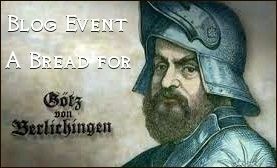 Also, the bakers' guild would descend on you for not being a Bäckermeister. I'm glad they encourage these small enterprises in Maine. Thanks, Karen – I do enjoy my little bakery.